NORTH KOREA: North Korean leader Kim Jong Un said he would halt nuclear tests and intercontinental missile launches, in an announcement made today and welcomed by US President Donald Trump ahead of a much-anticipated summit between the two men. The North had successfully developed its arsenal, including miniaturising warheads to fit them on to missiles, Kim said, and so “no nuclear test and intermediate-range and inter-continental ballistic rocket test-fire are necessary for the DPRK now”. The party decided that nuclear blasts and ICBM launches will cease as of today (Apr 21) – the North has not carried any out since November – and the atomic test site at Punggye-ri will be dismantled to “transparently guarantee” the end of testing. But Kim offered no sign he might be willing to give up what he called the North’s “treasured sword”, saying its possession of nuclear weapons was “the firm guarantee by which our descendants can enjoy the most dignified and happiest life in the world”. South Korean envoys have previously cited Kim as promising no more tests, but today’s news is the first such announcement directly by Pyongyang. Japan – which has seen missiles fly over its territory – gave a mixed response, with Prime Minister Shinzo Abe offering a cautious welcome but his defence minister saying North Korea did not mention the short- or medium-range missiles that put Tokyo within reach. Beijing reacted positively to the statement from its traditional ally, saying it believed the move would “help to promote the process of denuclearisation and attempts to find a political settlement” on the peninsula. 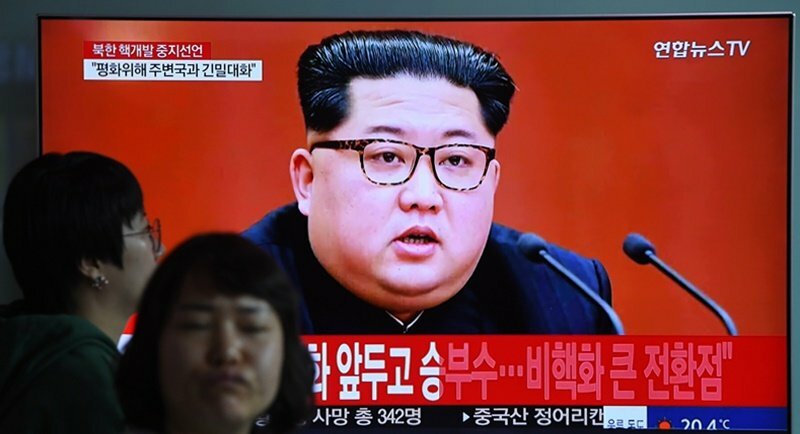 The formal declaration of an end to testing comes after Kim reiterated the North’s nuclear status in his New Year speech and said he had a nuclear button on his desk – prompting Trump to tweet that he had a bigger one of his own. But the leader said that as it was now a powerful state, “the whole party and country” should concentrate on “socialist economic construction”.